For Doris Hale, a Rainier resident, quilting has been a lifelong passion and endeavor. Hale, who has been a member of the Columbia River Piecemakers Quilt Guild since 2002, will be the featured quilter for the annual quilt show this weekend, Oct. 13, titled "Stitchin' in the Spirit of Halloween." She will be joined by Portland fiber artist Kathie Kerler, former editor to American Quilter magazine, as a featured artist. When Hale was 9 years old, her mother taught her how to hand-embroider. Since then, she has learned a variety of needlework, including quilting, crochet, knitting, macrame and cross stitch. At 16, Hale started working on her first quilt — an equilateral triangle pattern that outlined the Star of David. It took her decades to complete. Over the years, school, marriage and life simply got in the way of the project, she explained. The unfinished quilt, stored in a box at her mother's home, made its way back to her when her mother told her she needed to get the things she had been storing at her house. Hale found the unfinished quilt and realized she should finish what she started. When she picked it back up in the early 2000s, she was met with another challenge — matching the fabric colors. Many had faded or evolved over the decades. Some of the fabric was from a quilting box that belonged to Hale's mother, which had material from the 1930s in it, she said. "Color combination and patterns change. Coral or a peach color from the 1930s is not the same as it is today," she said. She spent nearly two years visiting quilt shops and fabric vendors, carrying swatches of what she needed, before she was able to match the fabric. "For this one, the blue was a men's shirting fabric, that turned out to be the right color," Hale said. "You just have to keep searching." Hale comes from a long line of quilters, including her mother, grandmother and great-grandmother. "(I enjoy) creating something that I can leave behind for my offspring," Hale said. "When I'm gone, that's what they'll have left." In many of her quilts, Hale likes to incorporate material with meaning. For example, after her mother passed away, she made a quilt out of fabric from her dresses. With a family of five children, eight grandchildren and eight great grandchildren, Hale is striving to complete a personalized quilt for each person, each piece including a memento of the family's heritage. Hale draws on the inspiration of her great grandmother, who created album quilts in the 1880s. Groups of women would create quilt squares for one another, sign them and then pass them to another person to be incorporated into a quilt, she explained. It was a way of showing people in your life that you cared about them enough to make something for them, a concept she appreciates. Many of her quilts also feature red-and-blue and paisley fabrics, of which she has always been fond. Hale explained that she has always been attracted to old quilt patterns, and is always striving to be a better quilter. "I have to thank all of my fellow quilters throughout my life for the lessons they have taught me," Hale said in part in a written statement. her over the years, she explained. Hale said she enjoys being a member of the quilting guild because of the connections it provides and the opportunity to learn new skills from other quilters who have experience in different quilting styles and techniques. "You have a community of people that are passionate about the same thing you are," Hale said. 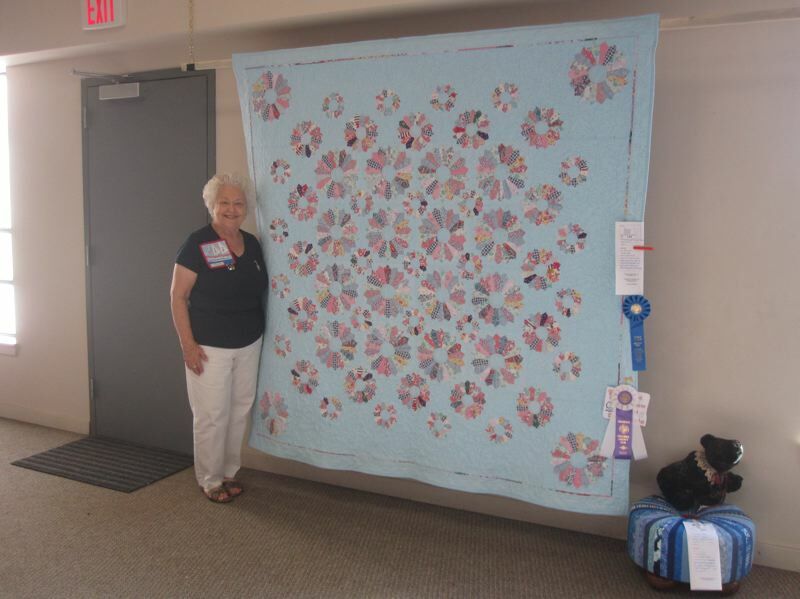 While Hale said she can't estimate how many quilts she's made in her life, she will display 40 pieces at the show this weekend. WHEN: Saturday, Oct. 13, 10 a.m. to 3 p.m.